The Punography Ltd. Directors have enlisted the help of classmate Sandra Ringo (Spieker) in creating an ongoing PowerPoint tribute to all of our RHS Class of 1969 classmates who have passed away. We will update this PowerPoint as time passes. Unfortunately, it will only grow larger, not smaller. Please contact us if you know of any of our deceased classmates who are not being acknowledged here and include any information that you know about that Fallen Eagle. Here is a link to a video memorial to the fallen eagles. (this may take several seconds to load, be patient!) or if you prefer you can view the slide show directly in Power Point at this link: Power Point Presentation. Alternately, we also have the presentation in a PDF format too, it is the smallest of the file sizes. PDF Presentation. If you see any errors about any Fallen Eagle in the video or Power Point presentation, please contact us and let us know who the Fallen Eagle is and what the error is. We'll correct the error right away. 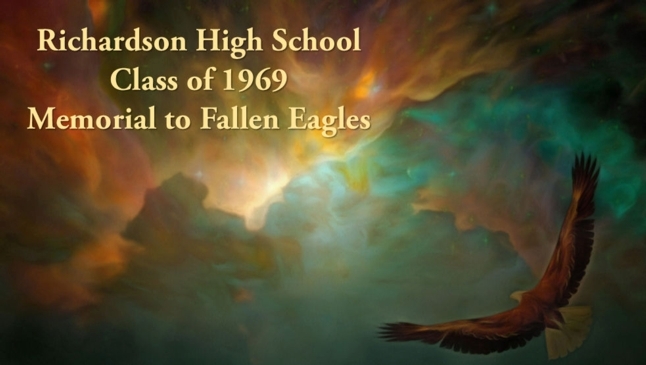 You can also visit the Eagles Profiles page for more information about each of the Fallen Eagles. Next to each Fallen Eagles' name is a rose icon . Click on the name to learn more about that Fallen Eagle. Also please share a memory or leave message if you wish.